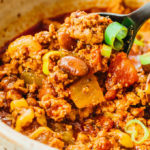 A meaty low carb and keto chili with ground turkey and beef, conveniently made in the Instant Pot pressure cooker. Select the saute mode on the pressure cooker for medium heat. When the display reads HOT, add ground turkey. Break up the meat as it cooks, about 5 minutes until browned. Add ground beef and repeat the process. Add celery, onion, and all spices. Cook for a few minutes, stirring frequently. Turn off the saute mode. Add black soy beans and diced tomatoes, including the liquid in both cans, and tomato sauce. Stir to combine. Top with 1/4 cup water and bay leaves. Secure and seal the lid. Cook at high pressure for 20 minutes, followed by a manual pressure release. Uncover, discard bay leaves, and stir the chili. Taste and adjust salt and other seasonings as needed. Serve with favorite toppings. This recipe yields 5.5 g net carbs per serving (1 cup or 1/8 of recipe).